Are you wondering if your child could be gifted and talented? Take a peek at these indicators which could show that they are a Gifted and Talented Learner or take this interesting quiz . Assessments to identify gifted learners may be given at your child’s school and/or you can ask your child’s doctor about further testing. If you’re a parent of an identified GT student looking for extra-curricular activities in a structured environment with other GT students, Best Kids Academy has multiple options for your elementary aged student. At home, connect and expand learning with your gifted child by asking them to compare and contrast topics or analyze things rather than just recalling facts. This will help students build higher levels of thinking and will likely reduce boredom for gifted students. The National Association of Gifted Learners is an excellent resource for parents of GT students; they give tons of ideas for toys, games, activities and gifts and they publish a free magazine with articles designed to support gifted students and their families as they develop. Why send your child to GT classes after-school? Gifted and talented classes support academic success on standardized assessments, encourage love of learning, motivate GT students, provide an additional learning community of like-minded learners. My girls and I took a tour of a typical school day at Best Kids Academy Montessori preschool this week. The school is clean, organized, decorated simply and fully furnished with Montessori child-sized furniture. My tour guide pointed out the unique feature, “that every item is able to be touched and explored by the children”. In one classroom, two children were observed working one-on-one on a project with a teacher and one child was happily exploring letter blocks on the rug. My toddler’s favorite features were the spacious gym and the nicely sized outdoor playground. The number of children at the preschool in each classroom and as a whole was extremely small so it appeared that students get a lot of one on one time with instructors and less interaction in large learning and play groups. How is Best Kids Academy unique? 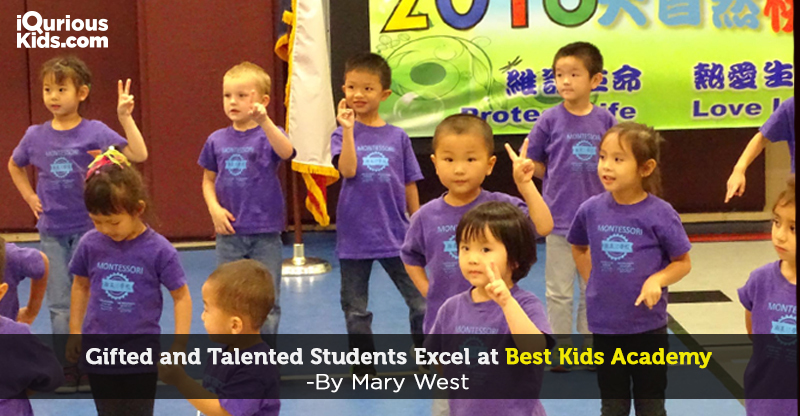 In addition to a fully licensed daycare/preschool, before/after-school tutoring and care center and weekend Chinese School, Best Kids Academy is a one-stop shop for sports, fine arts, GT classes, holiday/summer camps, Kumon classes, and other educational classes. Parents will appreciate: There are multiple options for days and times of classes which compliments today’s child’s busy schedule. Families will love that a whole family of children could potentially attend one location for multiple activities. While your daughter might attend a GT class, your son could take ping pong- BOTH at Best Kids Academy. That is certainly unique for many children’s activities and definitely a huge plus for busy moms and dads who would love to save some gas mileage and time. For parents looking for after-school childcare, Best Kids Academy provides an educational program which supports homework completion, reading, and other educational classes. For working parents, childcare options which support homework completion, reading and other tutoring all included in one price are rare- so definitely worth looking in to Best Kids Academy if that’s something important to you. They also have an open-door policy which welcomes parents in the center at any time. Where are they located? : In Katy ISD at 21915 Royal Montreal Drive, Katy, TX 77450. What they offer: A huge variety of classes (with extremely small class sizes), activities and childcare options. Sports include ping-pong, chess, and basketball. Fine arts include art and piano classes. Gifted and Talented options are available in the subjects of Math and English. They even have a mental math class, which is something many elementary students can benefit from. They also have an academic after-school care program, a weekend Chinese school, and a fully licensed, Montessori preschool. There are options available for half-days, full-days, transportation and much more. These customization options available for almost all of their programs also help parents choose the options most in line with their budget. Who do they serve? Students can attend the Montessori school between ages 18 months and 5 years. Extracurricular activities are focused towards K-5th graders while before and after-school programs are geared towards elementary students between 5 and 12. To sum it up: Best Kids Academy serves a LOT of different needs for a variety of students in the Katy Area. If you are looking at your options for activities, before/after-school care, Chinese school, pre-school, and more, it is definitely worth a call and/or tour at Best Kids Academy to see what they can help you with. I was really impressed by the custom experience they seem to tailor for all of their families’ needs. About me: Mama, wife, daughter, sister, teacher/tutor. I love playing and learning with my daughters, coffee, and binge-watching Netflix after 8 ‘o’clock! I dislike long lines and messes. My name is Aly and I would like to know if you would have any interest to have your website here at iquriouskids.com promoted as a resource on our blog alychidesigns.com ?